15th November 2017, New Delhi: The smog in Delhi NCR has become a regular affair. For the second consecutive year, the air quality in Delhi NCR in the first 2 weeks of November has reached toxic levels with PM 2.5 and PM 10 in the range of 600 – 1200. When the problem didn’t go away after a few days, the administration had to shut down schools and take other drastic measures to reduce pollution levels, including thinking of re-enforcing the even-odd rule. Many cases of children having breathing problems, asthma attacks and other issues have been reported by parents in the last 2 weeks. Many parents have suggested that some leaves could be reduced from the summer, spring and winter break to make way for the 20 days smog leave in November, so that the children could stay indoors, travel elsewhere and avoid the short and long-term consequences of this deadly air. The way things have worked out last year and this in regards to working of schools during smog, it has been an uncertain situation for families as to whether the school will operate or not. Many important activities and annual events also happen during this period and have been disrupted due to school shutting down on some days. Parents believe it will take the Government atleast a few years to figure out an effective solution and till then the November holidays should be made a planned break. 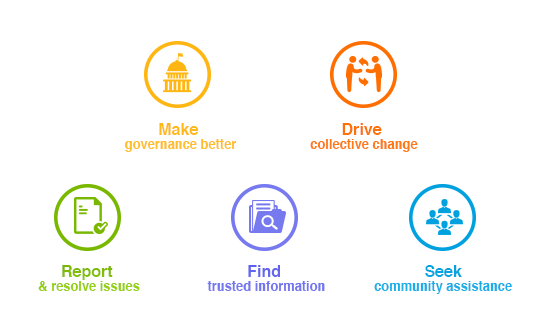 To ensure there was large scale resonance for this ask, LocalCircles conducted a survey which received more than 13,000 votes and was conducted across Delhi/NCR. 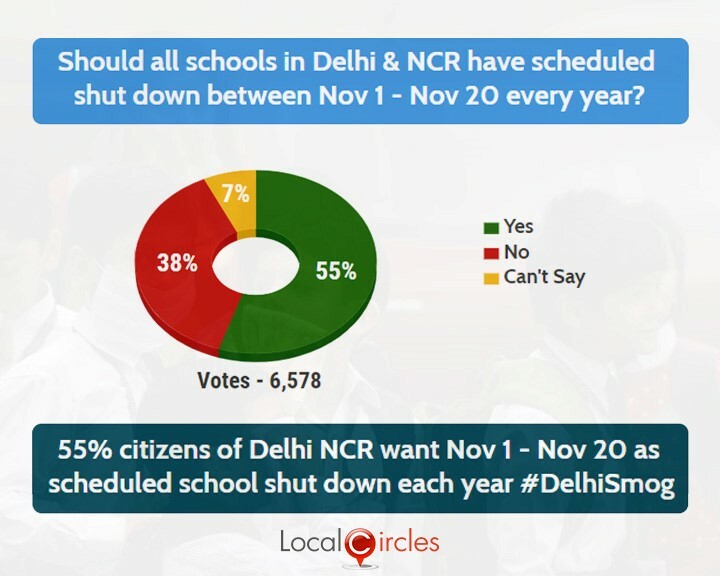 The first poll asked people if schools in Delhi NCR should have a scheduled shutdown between November 1 and November 20 every year to protect them from pollution smog. 55% respondents agreed with it while 38% did not agree with it. 7% were unsure if it should be done or not. Stubble burning in the neighbouring states of Punjab and Haryana has been identified by NASA Fire Mapper, industry experts and the Government as the major root cause for the poor air quality in Delhi NCR. Majority of the citizens also agree with the same. 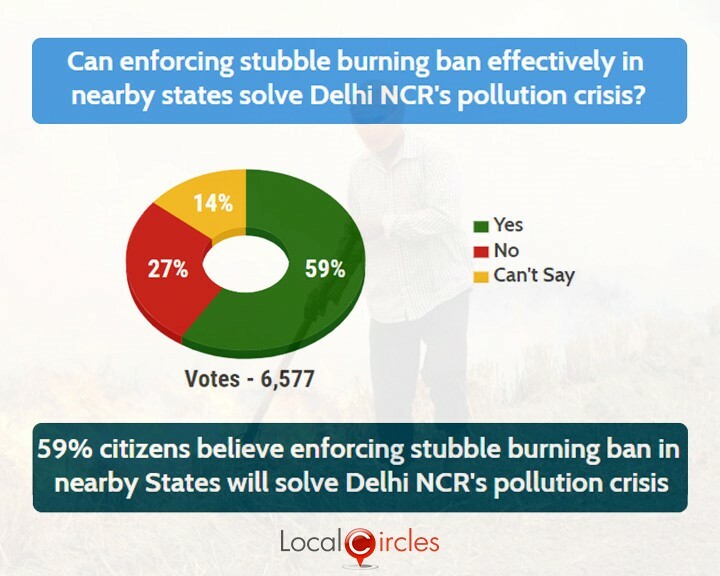 The second poll asked if enforcing stubble ban effectively in nearby states can solve Delhi NCR’s pollution crisis. 59% answered in an affirmative. 27% replied in a negative while 14% did not have any opinion on it. A stubble burning ban already exists in these states but there is limited enforcement by the state governments whatsoever due to the fear of losing the vote bank. In a related poll, 69% citizens suggested that CRPF could be deployed to enforce the ban. As per the CRPF role defined on its website, one of the duties that CRPF can be activated for is checking environmental degradation and protection of local flora and fauna.